Hi Stampers, Welcome to another Happy Stampers Bog Hop. Todays card was a sketch challenge. I used the vintage leaves stamp set and matching framelits for my card today. Fall is in the air and this set is perfect for making so many different fall cards. Here is my interpretation of the sketch challenge. I used several different fall colors on my art piece to mimic all the glorious shades from the maple trees in my yard this time of year. 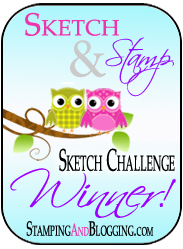 The art piece was inked and stamped using the Vintage Leaves Stampin Up stamp set. tiny round leaf: mossy meadow and crushed curry. I added some die cut leaves to coordinate with the art piece and add depth to the card. Green leaf: old olive sponged with old olive, Orange leaf: Tangelo Twist sponged with tangelo twist, Yellow leaf: crushed curry sponged with crushed curry. I repeated the same process for the leaves in the upper left corner to accent the sentiment. The finishing touch was the gold metallic bakers twine that was wrapped around the banner and a double bow added for more details. I could not stop at the bow, I needed to add some gold sequins with touches of pearls for the last element. The gold sequins tie the color of gold from the bow for that repetition of color and design. Do you need supplies to make this card? I would be happy to help you. You can shop on my online store by clicking the button at the top of my blog or contact me and I would be happy to help you. This entry was posted in Stampin Up Vintage Leaves, Uncategorized. Thank you Amy, I love fall and using all the wonderful colors of the season. wow, absolutely Stunning Card Kristi, love all those beautiful fall colors…you and I shared a brain stem this week, LOL….I love that. I smiled Sandi when I saw your card today, I guess great minds think a like. Thank you for stopping by. Thanks Mary, I love ribbons and the bakers twine adds details without all the bulk for mailing. Kristi, your leaves are beautiful, and I especially love the elements of wood with the DSP banner and the Wood-grain TIEF. The Gold Baker’s Twine gives it just the right pop, too! Very nice!! Thanks for stopping by Jari. I love fall so making fall cards just makes me feel good. Thank you Trudeaus, it was a fun card to make. I would love to receive this card….it would be on my table as an art piece….wow. Thanks Shelagh, I love doing these blog hops. I hope you do to.